If I told you that I spent my first few years of life in Greenwich Village, you’d think it was the chic-est of childhoods. In the 80’s, however, downtown Manhattan had a much different vibe. You were much more likely to find a used condom or discarded needle in the Bleecker Street sandbox than a stray Marc Jacobs handbag receipt or Magnolia cupcake wrapper. My parents love reminiscing about the time they were feeding me in my highchair when I let out an enthusiastic giggle and pointed to the countertop, where a massive rat was helping himself to scraps from the cutting board. There were still many charms, mind you. My green-haired preschool teacher, and the rock candy from Cowgirl Cafe that I’d get to eat after class were among the highlights. 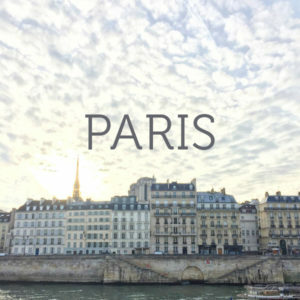 But when a work opportunity presented itself in Paris, my parents seized the day and moved our small nuclear family across the Atlantic for a new glamorous adventure, in a city with too many charms to count. Our new apartment was around the corner from the gold-domed Les Invalides, which I used to call The Emerald City. Preschool included bilingual vocab, and my afternoon snack involved a warm torn piece of baguette grasping a chunk of dark chocolate like a baseball mitt. Over the years, I’ve held onto these food memories far more vigorously than the vocab-—with the same enthusiasm, no doubt, that I clenched that afternoon chocolate tartine back in the day. It’s always a little hard to tell what childhood reminiscences are a product of seeds planted by parents over the years. But I know that my Paris days have drilled their way deep into my consciousness. When I go back, every street name sounds familiar, like the key to a long forgotten memory—-most likely an afterschool baguette purchase, or in more recent years, a pair of fancy leather chaussures. And after twenty-seven years since I first saw the Emerald City, and seven years since my last visit, Paris still feels like home. 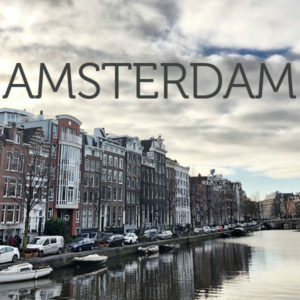 Last weekend, Charlie and I spent a whirlwind 4 days, 3 nights wandering the boulevards, freebasing butter, and making out in front of monuments. It was my birthday gift from him, and I fear that the bar is now set awfully high for my papa de sucre for future years–we had a ball. 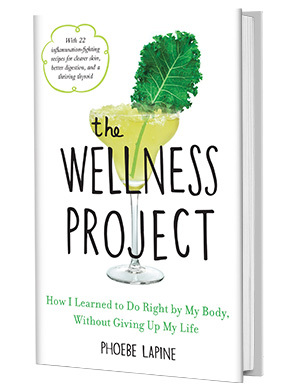 It was the first time I’d been back since going gluten-free and I was most nervous about all those taste memories I would miss without the ability to carry a whole baguette in my purse or impulse buy a chocolate eclair on any given corner. But the smells were what really take me back, more so than any shop or street sign. The musk of the metro, the caramelized sugar and crisping poulet roti meeting in the middle of a busy intersection. I took it all in and filled up in other ways. And, of course, I also made it my mission to track down as many gluten-free finds as possible. Helmut Newcake (best nom ever?!) was a heavenly angel for my eclair fix. Chambelland had gluten-free bread with the crusty texture of real baguette. And Claus had the most ridiculous matcha financiers I’ve ever eaten. For our meals, we tried to do a mix of old and new school: Bistrot Paul Bert for all the brasserie basics (steak frites, sole meuniere), Au Petit Tonneau for escargot and veal stew (which I took a dangerously non-GF taste of…worth it), and Breihz in the Marais for the most delicious buckwheat crepes and hard cider. Our best meal by far was Clown Bar, where the smoked pigeon arrived actually smoking on the plate, and the brains appetizer came fully intact and unadorned in all its cerebral glory. It was one of the most delicious things I’ve ever eaten. After all the sausage, brains and butter, I returned home majorly in need of some vegetable redemption. Knowing I wouldn’t be able to eat a lot of the earthy stews, I made a big vegetarian cassoulet before I left and froze portions for an easy homemade meal that I could reheat in the fog of jetlag. 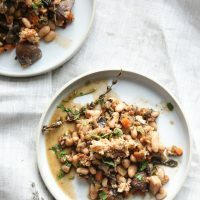 Cassoulet isn’t a dish I remember from my childhood days in Paris, but my mother was always finding creative ways to use flageolet beans in roasts and braises in the years that followed—-no doubt to keep the Francophile vibes alive in our far less charming and glamorous Westchester kitchen. 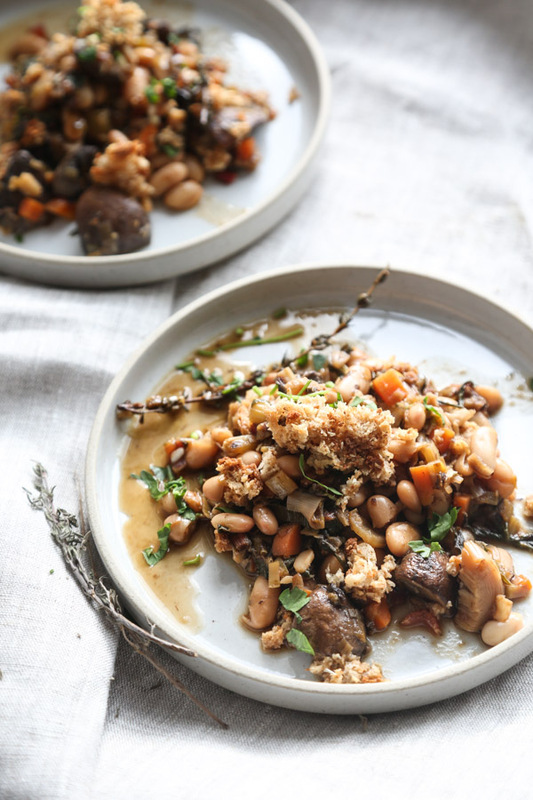 This rustic vegetarian cassoulet uses canned cannellini beans to cut down on the cook time so you can make it as a homey weeknight meal. But I think it is particularly impressive as a holiday centerpiece for the meatless folk. 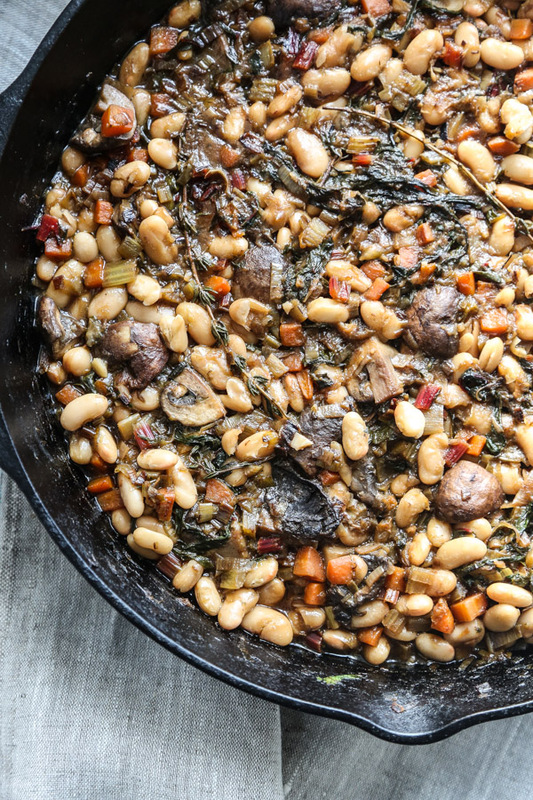 While cassoulet usually looks like a pile of brown glop, the leeks, carrots and red chard give the dish a hint of color and vibrance. The prep list might seem long, but layering flavors in the sauté pan allows you to chop as you go (mis-en-place be damned). First tackle the mirepoix: leeks, carrots and celery. Then tackle the mushrooms, garlic and chard while the mirepoix is browning. I don’t know the next time I’ll make it back to my glamorous homeland. So no doubt you’ll be seeing a lot more French favorites in these parts as I tick off all the dishes I couldn’t squeeze into my four-day eating spree. 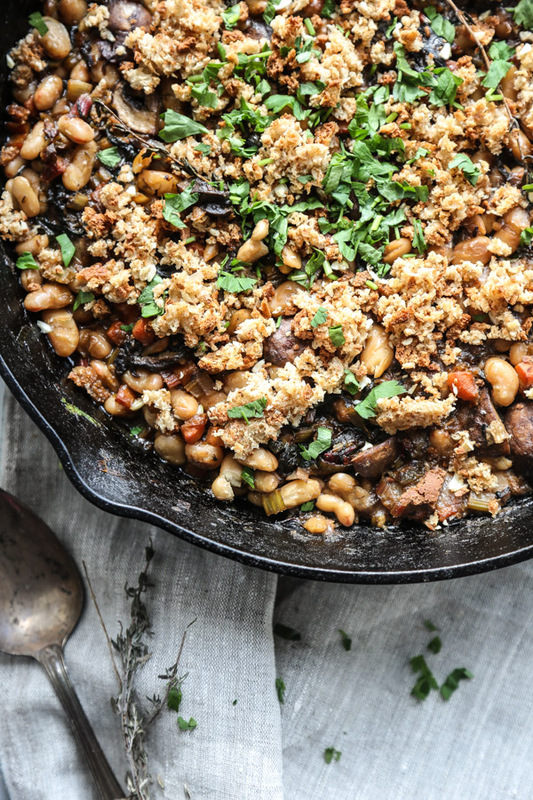 If you’re looking to let your French freak flag fly high this holiday season, I highly recommend this cassoulet for your Noel or réveillon de Nouvel An dinner. And like Charlie made me promise, I will hereby stop randomly inserting French vocab into all our conversations and just focus on those food memories. 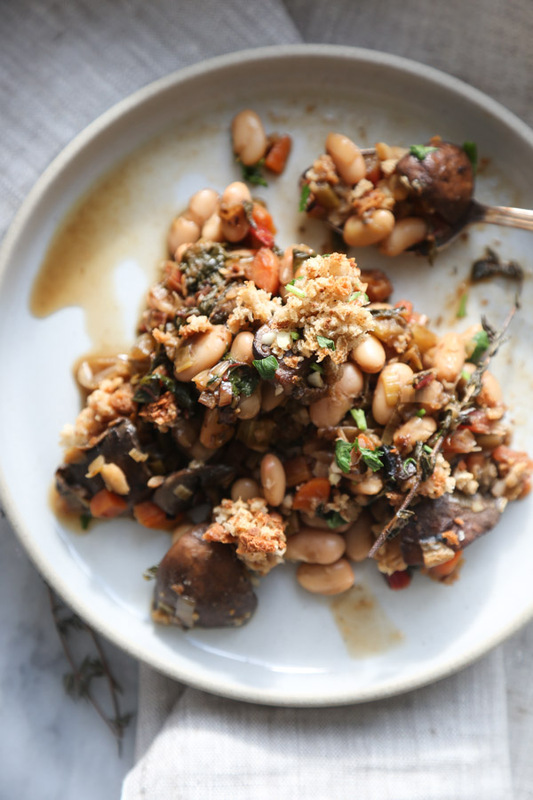 This easy French vegetarian cassoulet recipe is packed with white beans, leeks, mushrooms and chard. It's a cozy, comforting way to get your vegetables, especially on a more high brow holiday like New Year's Eve. It's a rare vegan main course that makes for a beautiful centerpiece that everyone will love. In a large cast iron or oven-proof skillet (a shallow Dutch oven will also work), heat the oil. Sauté the leeks, celery and carrot over medium-high heat until soft and beginning to brown, about 10 minutes. 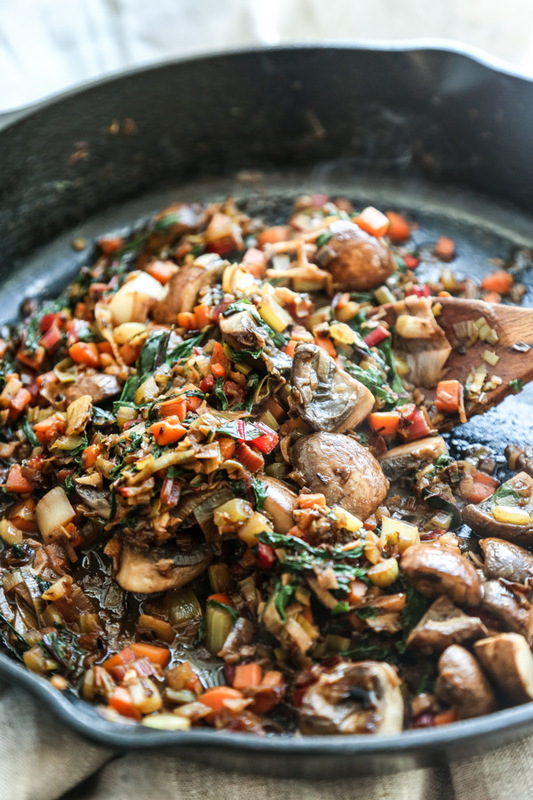 Add the garlic and mushrooms; continue cooking until the mushrooms have released their moisture and browned, about 5 minutes. Fold in the chard and sauté until wilted, 2 minutes. Season the vegetables with sea salt and pour in the wine, scraping up any brown bits that may have formed on the bottom of the pan. Stir in the beans to incorporate. Pour the broth over the bean mixture and arrange the thyme sprigs on top. Bring to a simmer and cook, uncovered, over medium heat until the beans are soft and the liquid is mostly absorbed, 10 minutes. 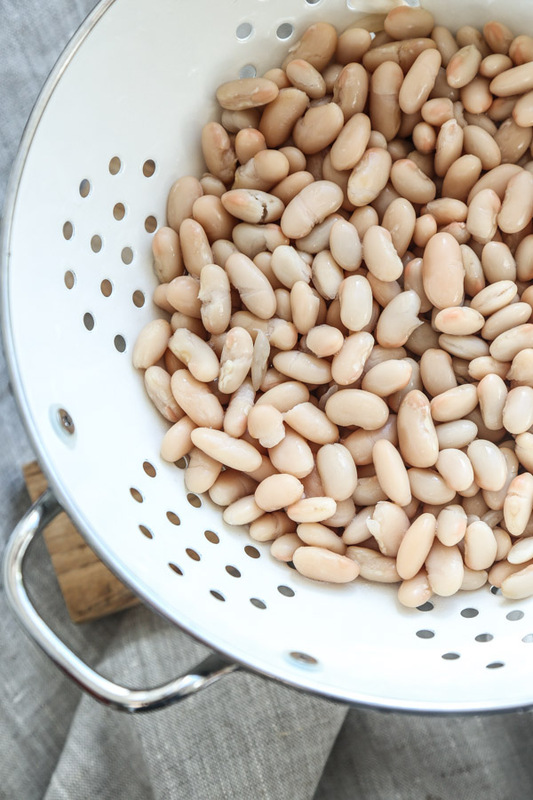 With the back of your spoon or a potato masher, smash a quarter of the beans to thicken the sauce. 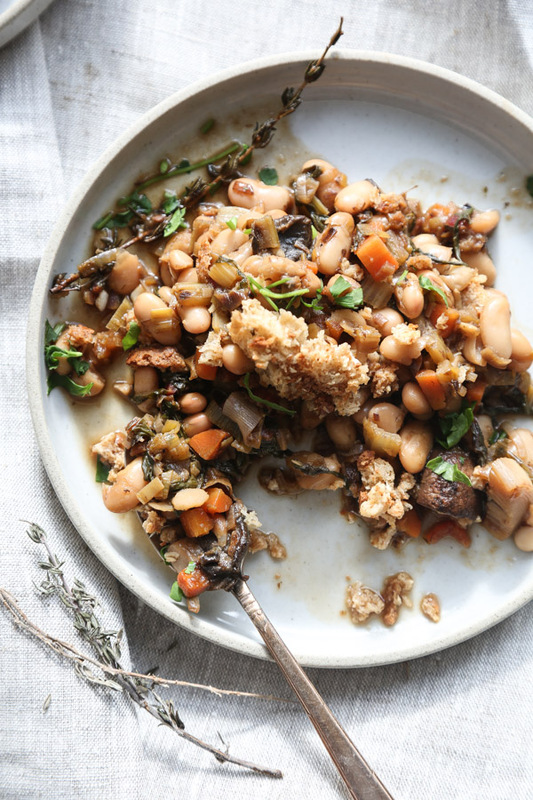 Sprinkle the cassoulet with the breadcrumbs and broil until golden brown. Serve warm alongside crusty bread or cauliflower mash. 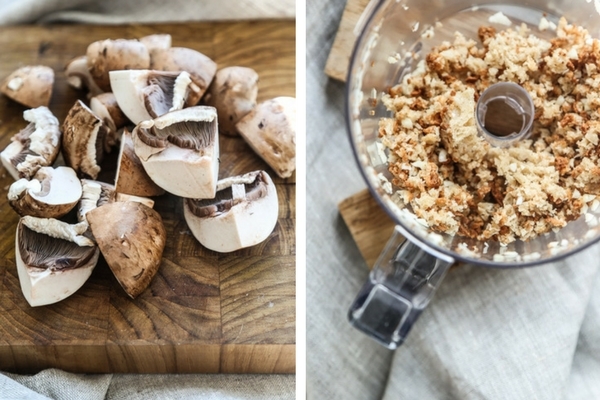 An easy paleo swap for breadcrumbs are nuts. Simply pulse in a food processor and toast in a dry skillet until golden brown and crispy. All of this sounds so dreamy! Glad you were able to find that GF baguette 😉 Rene and I will be there next week and I just can’t wait for all those jambon-beurre sandwiches. u guys are going to have the best time!!! wish we had overlapped! This recipe is beyond. Can’t wait to try it! Though I think I’m going to have to slip in some sausage. 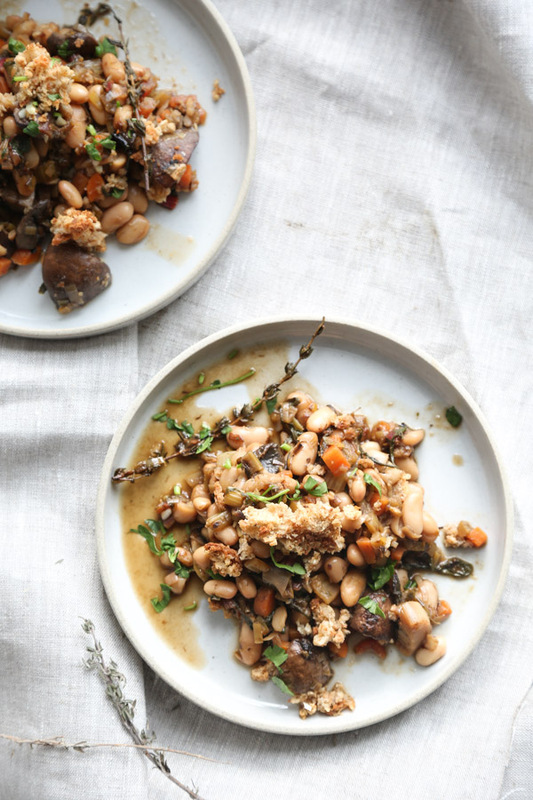 This cassoulet looks downright DELICIOUS! So warm and hearty. I can’t wait to give it a try on these cold winter nights!!! Thank you so much for this recipe. I tried it and it was delicious! yay! thank you for making! so glad you liked!